I don’t know how other people see me, but I like to think that I’m a reasonably laid-back sort of person; slow to anger, quick to forgive … that sort of thing. 3 years and 100 or so days ago, I wrote this piece about my experiences at Hillsborough on 15th April 1989. 2 days ago the Hillsborough Independent Panel published their report. They stressed that it wasn’t an inquiry – they hadn’t had witnesses or any powers – they had just been given access to ALL the evidence relating to the events of that day. I was at a meeting in the morning, an important meeting about how the United Reformed Church (my employer) might most effectively meet the training needs of Ministers and lay people, but I couldn’t really concentrate. I was refreshing my twitter feed every few moments as new facts dribbled out as the panel, quite rightly, first reported to the families of those who had lost loved ones. 164 Police statements had been altered to ensure that South Yorkshire Police Service wasn’t shown in a bad light and that officers were put under immense pressure to amend their statements. If they wouldn’t, it was done for them. The ambulance service had changed statements, too. Every victim (even a 10 year old) had their blood alcohol level checked and, for some, then had their names checked against the Police National Computer to see if there was a criminal record which could be used to ‘offset’ their innocence. Potentially, 41 lives could have been saved if medical attention had been forthcoming on the pitch. The facts kept coming and coming. I wasn’t sure how I was feeling – I had to pull over and stop the car to listen to the Prime Minister give his response. He sounded, on the radio, as shocked and genuinely appalled as anyone else. My blood was beginning to boil … but I didn’t know what I wanted to happen next. Having been blamed for the events 23 years ago I, my fellow fans, my football club and my city had been completely exonerated. It was a weight off my shoulders… but, as my original post had said “where there’s blame, there’s a claim”… the blame for the disastrous events had been laid firmly at the door of the FA, Sheffield Wednesday Football Club and South Yorkshire Police. What did I want to happen? I couldn’t really think about that… I was happy, delirious in fact, that at last, 23 years on, the truth had finally seen the light of day. Apology after apology started rolling in, starting with David Cameron and Ed Milliband. Quickly followed by SWFC, South Yorkshire Police, it took the FA a further 24 hours to apologise but even they made it eventually. The S*n and Kelvin MacKenzie apologised, too, but theirs was worthless and self-serving and, consequently, ignored by just about everybody. David Duckenfield, the police officer supposedly in charge that day, had been allowed to retire on a full pension at the age of 46 as a result of ‘Ill health’. Ill health is better than dying, eh, Duckenfield? And then I started wondering what Justice might actually mean in this context, what shape, form or action it might take. And I realised that I didn’t know. I certainly wouldn’t presume to speak for those who have lost in a far more tangible way than I, I can only speak for myself. What do *I* want? Well, I would like to know that those who were responsible for all that happened that day, who caused the problem and then failed to react effectively to the problem they had caused had been censured. I would like to know that some particular individuals (David Duckenfield) had paid a practical price – although I’ve no idea whether he even feels in any way culpable for what he caused. I would like to know that those who took deliberate actions to place the blame, knowing that the information they were giving out was completely incorrect, on the shoulders of Liverpool fans, both fully understand and accept their guilt and, I would hope are prosecuted to the fullest extent the law allows. I would like to know that those in the ‘establishment’ who caused this whole thing to be unresolved for 23 long years understand the immense pain and hurt they caused to so many people, not just the bereaved although, God knows, their pain has been more than most. Most importantly, I want the original verdicts of ‘accidental death’ to be overturned and new inquests held so that people like Anne Williams can get the answers she needs. Having not been able to define what I mean ‘justice’ to be in this context, I am quite clear what it isn’t: it isn’t vindictive retribution. So long as people feel genuine remorse and are sincere in their apologies (although, as stated, those who broke the law should be prosecuted irrespective of how sincerely they regret their actions). Except, maybe to Kelvin MacKenzie, the editor of The S*n at the time, who I hope burns in hell for eternity for what he knowingly did to besmirch the characters of the dead, of my fellow fans, of the football club, of the city, and of me. My elder brother, an Evertonian, sent me a text on the evening the panel’s report was published saying that he hoped I felt vindicated. At the time I replied saying that I didn’t, but I did feel less guilty for having survived and being made to feel that I was, in some way responsible. 2 days later, having thought about little else, I realise that he was right – I do feel vindicated. My blog of 3 years ago was wrong – Liverpool fans were in NO WAY to blame, late arriving or not. The actions of so many brave, respectful people, from those who lost loved ones in the disaster, from people like Andy Burnham MP, Steve Rotherham MP and Maria Eagle MP who wouldn’t let the House of Commons have a moment’s peace until something was done and the actions and voices of people, many many thousands of people just like me in refusing to accept that what happened that day was an ‘accident’ and have fought for 23 years to get someone to listen and investigate has been vindicated. People say that the most shocking revelation of the panel is that 41 of those who died could have been saved. I would remind you that, if people had done their jobs properly in the first place, in selecting a ground which had a valid safety certificate, in allocating tickets sensibly, in stewarding the ground effectively, in postponing kick off to allow those who had been delayed by traffic to access the ground … if these people had done their jobs properly then 96 people would not have died in the first place. 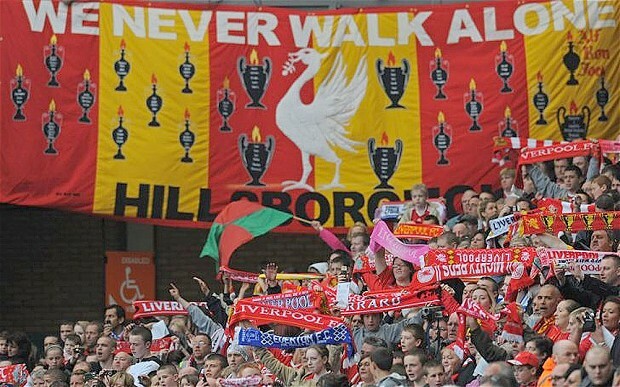 Justice for the 96 … and for all those still affected by the events in Sheffield on the 15th April 1989. 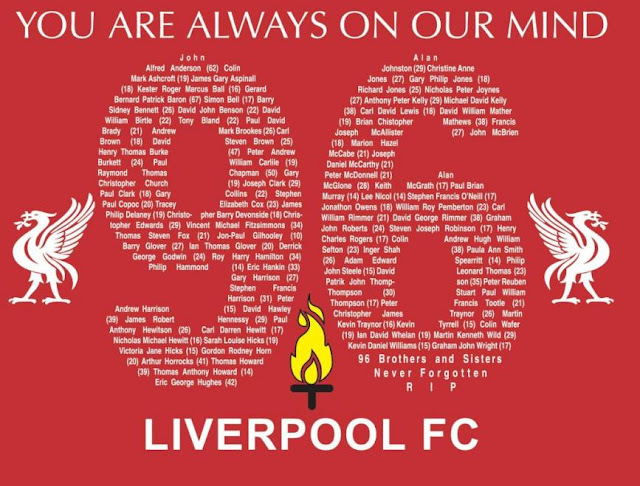 Yesterday was the 20th anniversary of the Hillsborough disaster at which 95 football fans lost their lives (with Tony Bland becoming the 96th some time later after his life support system was switched off by his parents). In the immediate aftermath of the event the blame was laid fairly and squarely on ‘ticketless and drunken’ fans arriving late to the game and forcing open the gates to the Leppings Lane end of the stadium and flooding onto the terraces crushing those at the front against the barriers. Who made these claims? South Yorkshire Police and the FA. Who added fuel to the fire? Kelvin Mackenzie and his ‘news’ paper – The Sun – with their bold headline 2 days after “The Truth” which told of Liverpool fans picking the pockets of the dead and urinating on them. I was at Hillsborough that day – as I had been the year before against the same opponents in the same stage of the FA Cup. My mate and I had set out at 11 o’clock and parked the car on an industrial estate a couple of miles from the ground. We got to the ground early (around 2:10 for a 3pm kick off) because the tickets had said that there was pre-match entertainment and we wanted to make sure we got a good spec. It was a lovely warm day as I remember. The atmosphere was easy going – we’d beaten Forest the year before and could see no reason why we wouldn’t do so again. We were top of the league and looking good for another ‘double’. 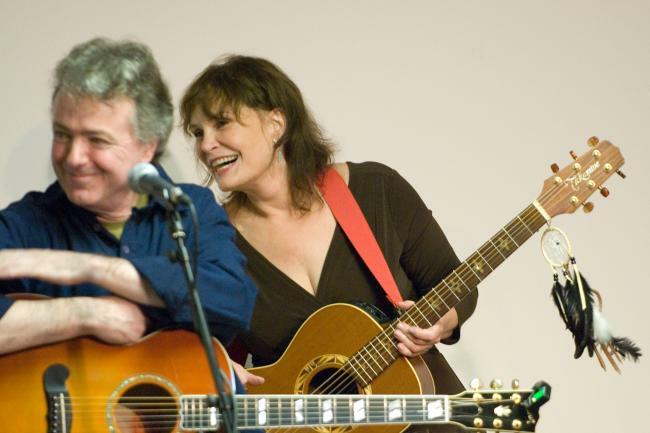 I can’t honestly remember when I started to think things weren’t quite right … Mike and I had positioned ourselves in front of a crush barrier – always the safest place to be – in Pen C of Leppings Lane. We’d had a choice when we got to the ground – you went through the turnstiles and, straight ahead of you, was a tunnel through which you could see the pitch. There were no stewards although that didn’t bother us as we’d been the year before and knew where we were going. Go through the tunnel and turn either left or right. Right put you in Pen B; left took you to Pen C. We chose left. We had a cracking spot, half way up the terracing, directly behind the goal in front of a barrier. Perfect. It was a bit squashed as the game kicked off, but nothing too unusual, it was an FA Cup semi after all. But it soon became clear that there was a real problem. Despite being in front of a barrier Mike and I were being slowly pushed forward. We had a decision to make. Mike wanted to move to the side, I wanted to get to the front where I thought there would be more room. We decided to try and move to the side. I didn’t make it, as soon as I moved away from in front of the barrier the pressure of the crowd buffeted me towards the front. I could see Bruce Grobbelaar looking nervously behind him – the match was still going on (although it was only 4 minutes since kick off) and I was still doing my best to watch it. The next few minutes are a bit of a blur. I’d lost sight of Mike and was being pushed relentlessly down towards the front. It was difficult to breath and there was a real feeling of claustrophobia – not a sensation I had ever felt. Before I knew it I was up against the railings at the pitch side. The game had been stopped (although that didn’t register) and I could see that there were people on the pitch in front of me. Police were trying to push back people, kids, who were trying to climb up onto the pitch. In the blink of an eye these same police were suddenly pulling people out. I had no idea what was going on behind me, I couldn’t turn around. My only two thoughts were ‘I’ve got to get out’ and ‘’I mustn’t lose my specs’. I knew I was in trouble. I couldn’t breathe at all so, as if in an avalanche. I just raised my hands high and hoped to get pulled out. I was. A police officer (all I can remember was that he was bald!) and some fans grabbed my arms and heaved. I fell onto the pitch where the next thing I remember was having a St John Ambulance man beating on my chest and pushing a tube down my throat (which resulted in 2 broken ribs and a ruptured trachea). I was carried to the sports hall underneath the Kop at the other end of the ground. When I came round I was lying on the floor of the sports hall. Around me were rows and rows of people. some were badly injured, some were like me but some had had their faces covered with black bin bags. No blankets, bin bags. I think that is the thing which most sticks in my memory. As I sat up a steward came over and asked if I was ok – I didn’t answer him, I just got up and ran out. I came out near the Nott’m Forest fans – some of whom were crying – they could see into the sports hall from where they were standing. The big gates were open just in front of me onto the street. I was still having difficulty breathing – it was later confirmed that 2 broken ribs was the issue. I had no idea where Mike was and so made my way down to the other end of the ground (where the terraces gates were) and tried to see him. I couldn’t find him. I knocked on a door in the street and a middle-aged guy answered the door. He was as white as a sheet. I asked if he had a phone I could use – he led me into the back room and just closed the door behind me. I tried to ring my wife, my mum and my elder sister – all were engaged. I tried my wife again and got through. She was relieved that I was ok and asked about Mike. I didn’t know. I told her I was going to look for him again. As I left the house, the owner came out with me and shouted to the crowds of people in the street that if anyone wanted to use a phone they could come into his house. I dread to think what his phone bill must’ve been like that month. There was no point looking for Mike, the streets were crowded and we could have easily passed each other without knowing it. So I decided the best thing to do was to head back to where I’d parked my car and wait for him there. It was a slow walk. My head wasn’t working right and I was scared that I wouldn’t be able to find the place where we’d parked. But I did – and Mike was already there, desperately waiting for me to turn up. He’d managed to get to the side and had climbed over the fence into Pen D from where he’d watched everything. So that was my day out. Started as a football game and ended in a hospital visit. But, as the ’story’ unfolded, it seemed that I, and my friends, were to blame. That’s what we were told by the police, the FA and the media. We had got drunk, we had stormed the gates to get in without tickets. We had killed our fellow supporters and then nicked stuff from the bodies and pissed on them. So it was all OUR fault – nothing to do with the Police or the FA. So they could not be blamed. oh, no. not them. They were not going to be held responsible. let’s face it, if they accepted responsibility, they would be sued. Where there’s blame; there’s a claim. So, let me make it clear here and now. I have no interest in compensation. I made no claim at the time, although I was entitled to. I have no intention of making a claim now. But I DO want someone to blame. I DO want to know that it was not all my fault. I know that the FA chose this ground despite it not having a valid safety certificate and that there had been previous problems with over-crowding. I know that, unlike the previous year, access to the ground was much easier. There was a much smaller police presence. I now know that Chief Superintendent David Duckenfield lied when he said that fans had ‘stormed the gates’ – he had ordered them to be opened. I know that there was totally inadequate stewarding – that, once you were through the turnstiles onto Leppings Lane, there were no signs telling you were to go, but there WAS a tunnel straight ahead of you through which you could see the pitch – where would you go? I know that, when you die, your bladder empties. That explains the urine on the terraces. I know that Police did not come onto the terraces straight away so fans tried to find evidence of who the bodies were. I am sure that the Police, the FA and the Thatcher government were delighted to be able to blame people from Liverpool and were happy to use their influence with the media (particularly The Sun) to divert people away from the truth. I know that there are people who are to blame. I know that maybe that includes some Liverpool fans who DID get to the game late, but that still happens now. They weren’t desperately late – and it wasn’t all their fault – there were unexpected roadworks which delayed traffic to the game, there was an antiquated turnstile system that kept blocking up making entry very slow, and there was no more drinking that day than at any other football game. But I want the people in authority who made stupid decisions and told lies about me, to accept that they were at fault – and admit it. But, more than anything, I want someone else to share the blame for what happened. I don’t want to feel guilty for the rest of my life. Guilty for being there. Guilty for surviving. 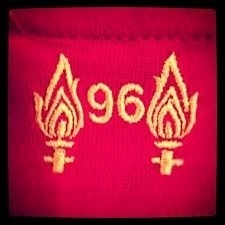 Justice for the 96. And for me.